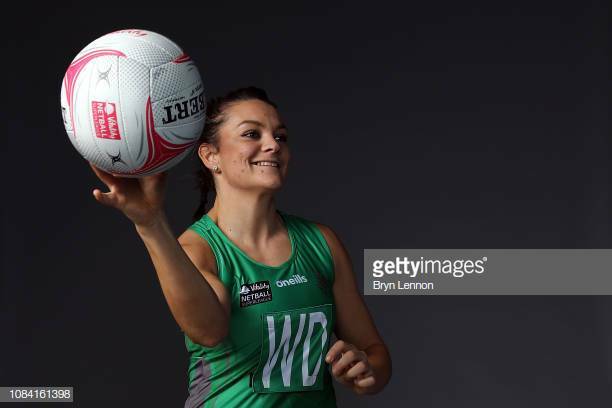 Celtic Dragons finished on a high when captain Nia Jones presented head coach Tania Hoffman with a cake – and the players sang happy birthday. It was a moment which showed Dragons’ team spirit and togetherness, but could not hide the frustration felt after the 66-44 Vitality Netball Superleague defeat against Saracens Mavericks. For half of the match at Cardiff’s Sport Wales National Centre, played in front of loud and proud Green Army fans, Dragons matched their visitors. The score was 18-18 during the second and there were only five goals in it at half-time when the Welsh team felt confident they could kick on and put Mavericks under pressure. Celtic Dragons players sang happy birthday to head coach Tania Hoffman. But it didn’t work out that way and Hoffman said: “We were only five down going into second half, but lost five goals quickly in the third quarter. “We have to put it all together. You don’t games in the first half and we are disappointed with the end result. “There were clear signs that we can be competitive, but we must learn how to win. “Mavericks are a tough side and have real quality. We have genuine quality as well, but we also have a level of inexperience. Kyra Jones in possession for Celtic Dragons. Dragons sent on highly experienced centre Claire Elsey for Kyra Jones during the third. Soon after Jones switched to Wing-Attack. Abby Tyrrell and Eleanor Roberts went on for Goal-Keeper Stacian Facey and Goal-Shooter Chelsea Lewis. Dee Bolakoro switched to GK with Tyrrell playing Goal-Defence. “There were tired legs out the because the girls were working so hard for each other,” said Hoffman. “It was good to get Claire, Abby and Eleanor on court. A big difference between the teams was the physicality and presence of Goal-Shooter Georgia Fisher, who was voted player of the match. There are strong signs that Dragons shooters Kalifa McCollin and Lewis are building a solid partnership, while Facey and Bolakoro battled fiercely against the threat from Fisher. Mavericks coach Kat Ratnapala said: “It was a hard slog in the first half. “The second quarter was better in terms of attention to detail and in the third we came out firing. “Kadeen Corbin was outstanding, scoring 21 goals from 22 attempts, and George Fisher held her own in the circle and demanded space. “Her player of the match award was well deserved. In the second Netball Superleague match played on Monday, Manchester Thunder defeated London Pulse 62-47. The next fixture for Celtic Dragons is against Stratchclyde Sirens in Glasgow this Friday, while their next match at the SWNC is against Wasps on Monday, February 18 (7pm). Quarter scores (Dragons first): 15-16; 10-14 (25-30); 9-19 (34-49); (10-17) 44-66. Celtic Dragons: GS Chelsea Lewis, GA Kalifa McCollin, WA Suzy Drane, C Kyra Jones, WD Nia Jones (capt), GD Dee Bolakoro, GK Stacian Facey. Reps: Lucy Howells, Lucy Herdman, Abby Tyrrell, Clare Elsey, Eleanor Roberts. Saracens Mavericks: Razia Quashie, Lindsay Keable, Michelle Drayne, Sasha Corbin, Georgia Lees, Kadeen Corbin, Georgia Fisher. Reps: Steph Collard, Beth Ecuyver Dale, Ellie Kelk, Paige McCalla, Jo Trip.